A classical looking open day boat, featuring a boomed gunter rig, jib and mizzen, they are great for cruising the islands and are very stable. When the fully retracting centre plate is up they float in ankle deep water. Our Drascombe Dabbers make for the perfect Swallows and Amazons experience on Scilly. Before hiring any equipment with us, please check our required experience policy and discuss your requirements with our staff to make sure you won’t be disappointed. Water Taxi, Special Charters, RYA Courses. 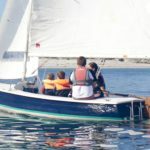 Our activity specials are tried and tested fun, adventure-filled and memorable moments on the water. Honwave 4m boats for hire. These simple and seaworthy boats are perfect for heading off to explore the islands for yourself. Powered by a 6Hp outboard, perfect to head off and picnic on another island or do a spot of fishing.